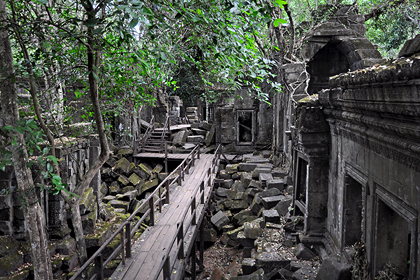 Beng Mealea is a Khmer word meaning “lotos pond”. Other transcriptons of this Khmer temple's name are Bang Malea, Bang Melea, Bung Melea, Beung Mealea, Boeung Mealea. Beng Mealea, located in 60 km distance from Siem Reap and Angkor near the southern foot of Kulen mountain, is “the romantic temple ruin in the jungle” par excellence. Its stone strangling trees may be smaller than those of Angkor's jungle temple Ta Prohm, but there are many more trees covering the walls of temple edifices in Beng Mealea: The temple is truely a forest, an ensemble of ruins and intact buildings with trees growing out of temple towers, vines entangling walls and columns, and lichen covering stones. 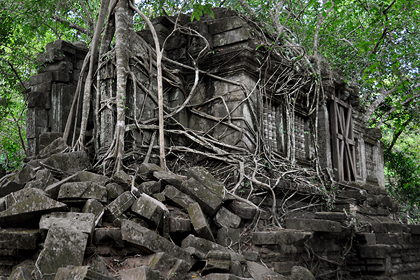 Due to a lack of inscriptions Beng Mealea can only be dated by stylistic characteristics. 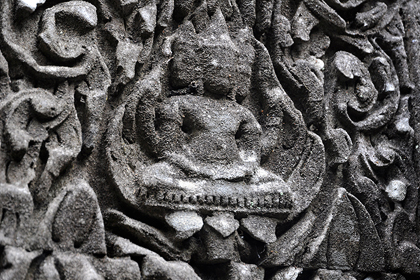 Beng Mealea is ascribed to the classical Angkor Wat period, since the ground plan of Beng Mealea is similar to that of Angkor Wat and there are some similarities in relief art, too. 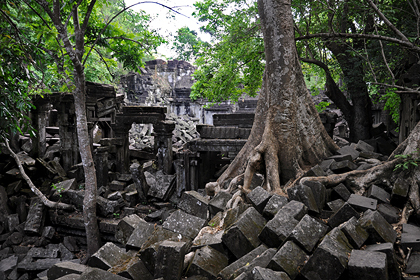 Beng Mealea may have served as a prototype for Angkor Wat just before or during the reign of Suryavarman II. (1113-1150), or it was a later copy of Angkor Wat, in this case it could have been completed under Dharanindravarman II. (1150-1160), who was the father of the well-known later Buddhist king Jayavarman VII. Beng Mealea is located close to a strategically significant fork, where the the ancient road to Preah Khan of Kampong Svay (Prasat Bakan) branches off from the royal way from Angkor to Koh Ker, Preah Vihear and the South China Sea coast. A small Angkorian bridge just west of Chau Srei Vibol temple is the only remaining trace of the ancient road between Angkor and Beng Mealea. Between Beng Mealea and Preah Khan there are at least 10 bridges abandoned in the forest. Being only 7 km away from the sandstone quarries at Phnom Kulen, Beng Mealea is at the head of the historical canal that was used for the transport of sandstone blocks to Angkor. 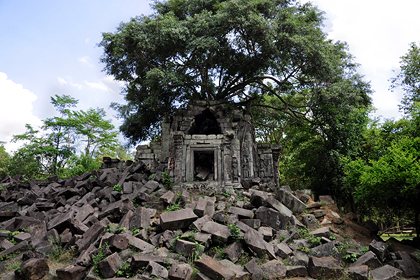 Beng Mealea was formerly supposed to be the fourth capital of Jayavarman II, Mahendraparvata, where he declared independence of his new united Khmer empire. Others believe it could habe been a supplementary capital besides Angkor. The walls of Beng Mealea are bare and do not seem to have contained bas-reliefs, but they may have been covered with frescoes. 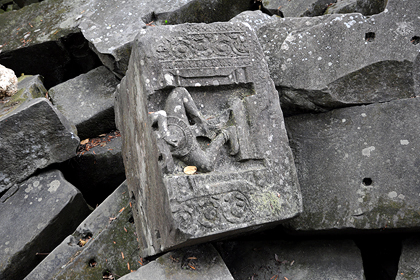 No sculptures have been found in Beng Mealea. Coedès has made a special study of the carvings. They are mainly scenes from the legends of Vishnu and his Avatars, Kurma, Rama, and Krishna. However, other Brahmanic deities, Shiva, Brahma, and Ganesha, also figure in scenes. 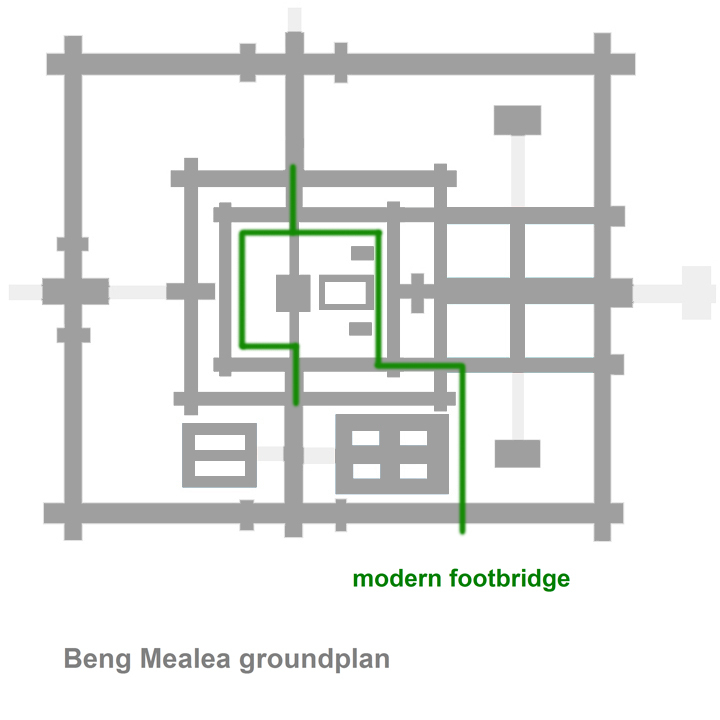 Unlike at Angkor Wat, the original ground plan of Beng Mealea could have been modified and some structures may be later additions. 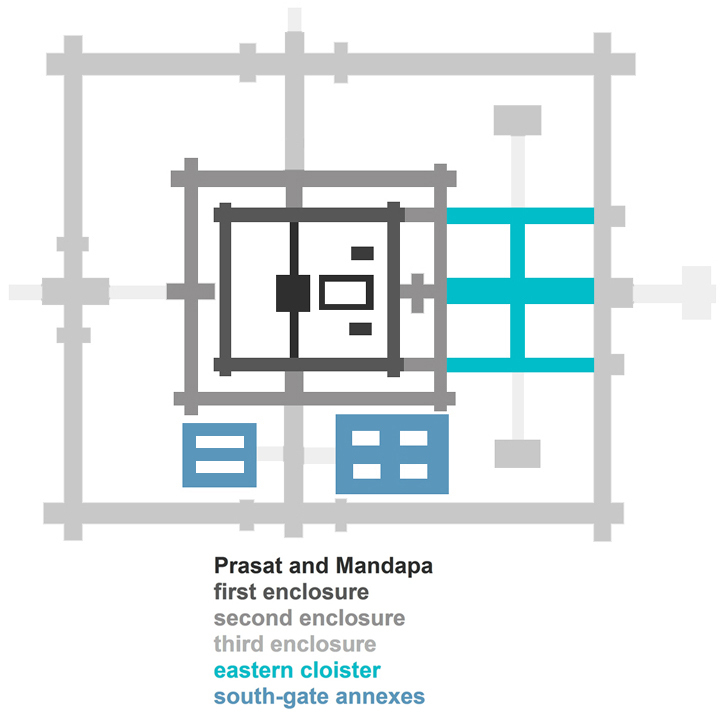 Between the second and third enclosures there are two buildings called annexes behind the southern Gopuram (gateway) that do not fit in the symmetrical layout of the rest of the complex. They are also called palaces. Like other large Khmer temples Beng Mealea is surrounded by a moat, partly dry now. It measured 1,025 m by 875 m, that’s almost the length of Angkor Wat’s moat, but it`s not as wide (45 m, (Angkor Wat: 200 m). 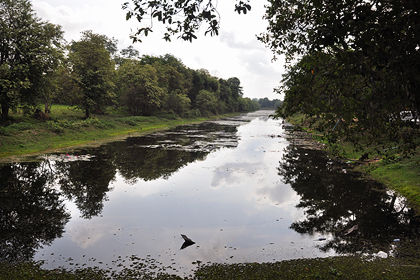 Maybe Beng Mealea’s moat was originally surrounded by a timber palisade serving as a fourth enclosure. Like at Angkor Wat the island was a whole city, the temple being only the central structure, the only one made of stone. Four causeways cross the moat at the cardinal points. To the east was a large reservoir, vast Barays are usually found near cities that served as royal residencies, e.g. Angkor, Roluos, Koh Ker, Prasat Bakan, Phimai. Maybe Beng Mealea served as a supplementary capital like Prasat Bakan. But there is at least one other temple town with a huge Baray that never served as royal residence, Banteay Chhmar. Four axial pathways lead from the causeways to the cruciform terraces in front of the temple gates. These long avenues were paved and had lateral steps and Naga balustrades. Naga balustrades flank the terraces, too.. Beng Mealea’s Naga balustrades presented two innovations, the appearance of the aureole in a kind of spearhead and moulded blocks of support for the serpent’s body at regular intervals. Naga, though a Sanskrit word for cobras, became a term for snakes in general and particularly for mythological beings able to take the shape of a snake. Nagas play a significant role in Asian beliefs, in Indian folk religion they protect wells and streams and bring rain and fertility. The Cambodian people is said to be born from the Nāga, since Khmer are the offspring of the marriage of an Indian called Kaudinya with a serpent king´s daughter. Terraces on higher levels at the end of pathways in front of the temples were introduces in the style of Angkor Wat, they usually have a cruciform ground plan. Maybe Beng Mealea is the first example. They could have served for public services in front of the temple, as access to the temple proper was reserved for royals and priests and other high dignitaries. 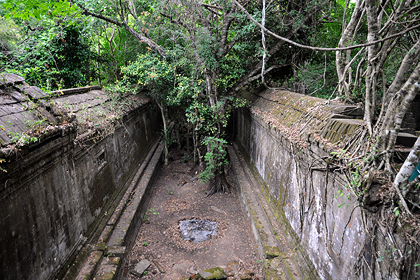 Beng Mealea’s largest terrace is in front of the main gate at the east side. Today’s visitor will arrive in front of the southern gateway. It is not exactly in the centre of the southern wall but slightly shifted to the west. Gates of Khmer temples are called Gopurams, a term used in Indian architecture mostly for the typical very tall gates of Tamil temples. The Sanskrit term consists of two parts, “go” is ususally the word for "cow" but can also mean "sky", “pura” is a well-known word meaning “city”. The temple`s exterior (third) enclosing gallery is 181 m long (east-west) and 152 m wide. Before entering the temple from the south you should have a look to the south-eastern corner. Each of the corners was surmounted by a tower, similar to the galleries of the Angkor Wat. The French Angkor explorer and artist Louis Delaporte draw a picture of Beng Mealea giving it 11 towers altogether. The south-eastern corner tower is now roofed by a tree growing inside the tower. This kind of central “rooftop-trees” is something special even in Cambodia, land of jungle temples. Edifices of this kind can be seen on Phnom Bok in Angkor, too, but that`s on a hill almost never climbed by tourists. If you walk a little bit further to the east side, you will find the largest terrace with Naga balustrades. The procession alley was flanked by pools, one of them still has water. The wooden footbridge leading to the inner courtyards begins just east of the South-Gopuram. Entering the third enclosure you will see a separate elongated building on the right side. It`s one of those structures usually called “libraries” in descriptions of Khmer art. Normally they are placed south-east of the temple proper, large temples have many libraries. Their purpose is not clear, but the term library may be appropriate: Modern monastery compounds in Southeast Asia have a separate building within the temple courtyard for safekeeping of Holy Scriptures or liturgical divices. This means, it’s a kind of sacristy for manuscripts. Modern monastic libraries are wooden constructions, however, they may have had predecessors built of stone. 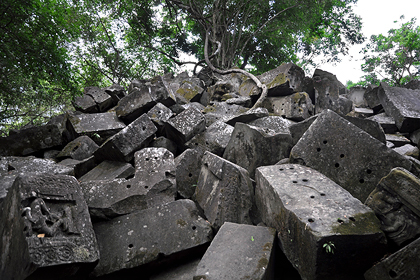 The stone used in Beng Mealea is the bluish sandstone from the nearby quarries at the southern slopes of Phnom Kulen. Like Angkor Wat, Beng Mealea has two library buildings in the courtyards between exterior (third) and second enclosing galleries. The north-western library is rarely visited, because the wooden footbridge does not reach this remote north-eastern angle of the temple compound. But it’s worth climbing a little bit to see this very tranquil area. 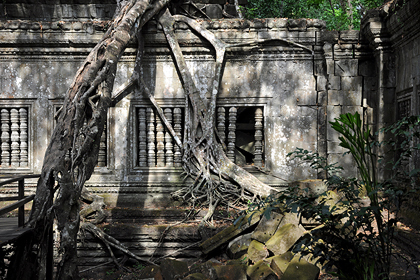 The otherwise well-preserved north-eastern library is picturesquely covered by the thin roots of a strangler fig. “Strangler fig” is not a scientific term for a specific tree species but a colloquial name for different kinds of trees forming a web of roots. 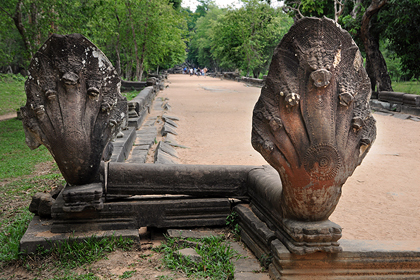 Strangler figs growing on Khmer temples are often Banyan trees (Ficus benghalensis). Most strangler figs start growing as epiphytes without touching the ground, they germinate in crevices at buildings, rocks or other trees, the seed is usually dispersed by birds. Beng Mealea`s enclosures are concentric and slightly shifted to the rear, opening a wider space between main entrance and second enclosure. Like at Angkor Wat this space is filled with the libraries mentioned above and with a new feature of the Angkor-Wat style, a cruciform cloister of galleries tying together the walls of the exterior and second enclosure. Unlike Angkor Wat’s cloister ("hall of 1000 Buddhas") that of Beng Mealea is in ruins now. If older than Angkor Wat, Beng Mealea’s gallery corridors invented two new features, wide galleries entirely vaulted in stone and the roof supported by a wall on only one side but by a row of pillars on the other one. Some places even had two rows of pillars instead of walls, but these parts of the galleries are mostly broken, double rows of pillars occured at cloister galleries in particular. Apart from the cloister in the east of the temple compound there are 2 smaller complexes quite similar to cloisters but separated from enclosing walls, near the South Gopuram. You will see them on the left side when entering the temple proper. These richly decorated buildings are called annexes or palaces and could be later additions. They spoil the symmetrie of the temple proper and have no parallel in the scheme of Angkor Wat. Another difference between the ground plans of Beng Mealea and Angkor Wat is: The gallerie walls of the second and first (inner) enclosures are running parallel in only a few metres distance in Beng Mealea. The galleries mark the abandonment of the enclosing of wooden beams in hollowed stone, another typical feature of the classic style of Angkor Wat, besides cruciform terraces, cloister courtyards and colonnades instead of gallerie walls. Altogether three almost concentric galleries (slightly shifted as in the case of Angkor Wat) enclose the central Prasat sanctuary. The inner courtyard can be reached easily, since there is a large wooden walkway from the south-eastern wall of the exterior (third) enclosing wall to the very centre of the compound and beyond. This footbridge was originally constructed for the setting of the adventure movie “Two Brothers” (Deux Frères) in 2004. The plot is about two tiger brothers, who are separated as cubs and reunited a year later on, in the 1920s during French colonial rule. The main subject of the film is conservation of tigers. Art theft is a topic of this movie, too. Annaud is famous as the director of “The Name of the Rose”, an adaptation of Umberto Eco’s bestseller novel of the same name. “Seven Years in Tibet” was a film about the life of Heinrich Harrer. The first (innermost) enclosure a complete temple in itself, its arrangement is similar to smaller and medium-sized temples in the classical style of Angkor Wat such as Banteay Samré, Wat Athvea, Thommanon and Chau Say Tevoda. Four pavilions with towers marked the corners of the first enclosure. Two more library buldings, smaller than those of the third (exterior) enclosure, are located in the north-eastern and south-eastern parts of the courtyard. The central sanctuary is preceded by a elongated room to the east, a typical Mandapa antechamber in front of the main shrine. 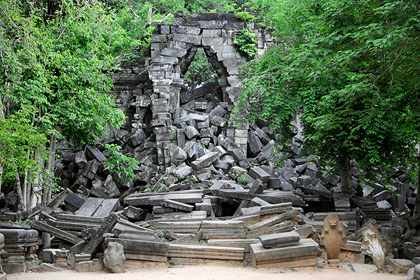 This central Prasat completely collapsed, is only a huge heap of stone blocks now. It seems to have been the only building in Beng Mealea on a higher level than the others. It was not a temple pyramid as high as the Angkor Wat, but may have been similar to the substructure of Preah Palilay. Unfortunately, Beng Melea is not as well preserved as Angkor Wat, though it is protected by a moat, too. But the moat is not as wide as that of Angkor Wat, thus seeds of trees had better chances to cross it. Another reason is: Angkor Wat was never abandoned, it has been a monastery for centuries. 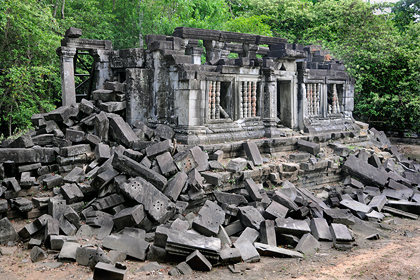 In contrast, Beng Mealea has been deserted for centuries, never maintained by Buddhist monks. But there are different reasons for different kind of damages. The construction of Beng Melea’s galleries was less perfect than that of Angkor Wat’s galleries. And some parts could even have been demolished arbitrarily. But what`s deplorable for lovers of art, is delightful for other visitors at the same time: Beng Mealea is the paragon of an ancient monument lost in the jungle. Lovers of romantic ruins will hardly find a more amazing overgrown temple in the tropical zone of the world. 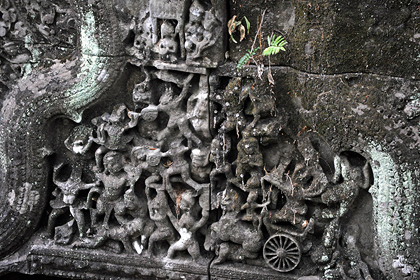 Beng Mealea's carvings, discreet but of excellent craftsmanship, show legends of many Hindu deities and the Buddha, too. Vishnuite themes are predominant. Due to the dilapidated condition of this temple, it is not easy to find and interpret the reliefs. Most walls are plain, the decoration is animated only in certain areas. 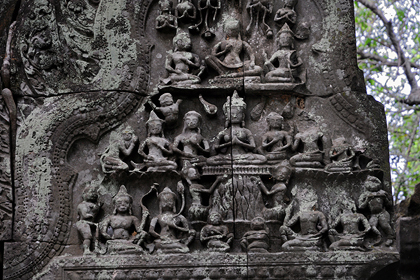 In the classical style of Angkor Wat both lintels and frontons are carved with scenes, capitals are adorned with ornaments. Before the Angkor Wat period, of which Beng Mealea marks the beginning, only few Khmer temples had scenic reliefs on a huge scale, the Baphuon being the most prominent example. Jewelled Devatas appear at walls occasionally, they have long pleated skirts and a fold of cloth in the middle, a modification of the Baphuon fish-tail. For the first time, they show the strange sidewise position of the feet so noticeable at Angkor Wat. Disturbing the symmetrical layout of the Beng Mealea complex, there are two large edifices or small cloisters on the south side of the third enclosure, thought to be “palaces” or halls of ritual dances. More neutrally, they are called “annexes”. 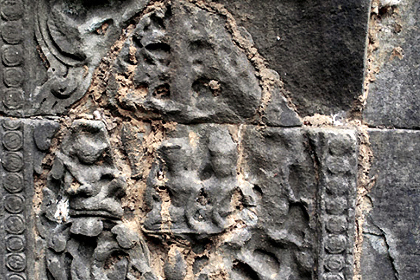 Most of Beng Mealea’s lintel, fronton and pilaster carvings are found at these two annexes. There is only one pediment relief outside these annexes. It is at the southern door of the eastern gallery of the first enclosure, facing east. It depicts Krishna lifting Mount Govardhana, a common sujet in Indian and Khmer art. The same theme is also found at one of the pilasters of the western annex (photo). The doors of the annexes also show lintel carvings but smaller than in previous styles when frontons were less emphasized. Krishna lifting Mount Govardhana, sheltering the shepherds and their flocks from the storm raised by Indra, is a typical theme of Vishnu mythology, Krishna being his incarnation. The story is told in the fifth chapter of the Vishnu Purana, one of the texts forming Hindu mythology and iconography till the present day. When Krishna saw preparations for an annual offering to Indra, he debated with the villagers about what their "dharma" really demands and tought them, their duty was farming and protection of their cattle instead of conducting sacrifices for natural phenomena. But when the villagers refrained from offering Indra, god of waters and weathers, he became furious and sent a thunderstorm to flood the village. In order to protect his followers and their cattle, Krishna then lifted Mount Govardhana as a shelter. For seven nights Indra showered down rain. But finally he gave up and accepted defeat. Indra was the highest god in the Vedic scriptures, which were composed one millennium earlier than the Puranas. The point of the Purana story is the supremacy of Krishna, not mentioned in the Vedas, representing a new concept of duty (dharma): devotion and trust instead of rituals of sacrifice. At the western annex there is another depiction of a famous episode from the life of Krishna. The fronton above the northern door of the eastern wall has the scene of Krishna fighting the demon Bana. Krishna, here almost identical with Vishnu, is mounted on Garuda on the left side, while his adversary is in a chariot drawn by lions on the right. A small couple in a palace shelter at the top of the fronton is perhaps Aniruddha and his wife Usha. Bana is an Asura, thus often called Banasura. When Bana worshipped Shiva, the god promised to fulfill a wish for him. Bana arrogantly asked Shiva to be his guard. Usha, Bana’s daughter, fell in love with Krishna's grandson Aniruddha. Bana was enraged and captured Anirudha. When Krishna arrived, Bana attacked him. Krishna was about to kill Bana when Shiva asked him to spare Bana's life. Krishna agreed and Bana asked Shiva to forgive him. 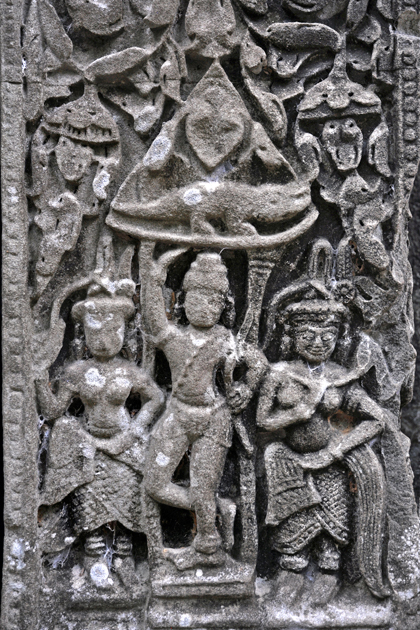 At one of the pilasters of the western annex in the third enclosure is a scene from the Ramayana epic, depicting Sita under an Ashoka tree with Rakshasas. Sita is held in captivity in the grove called Ashoka Vatika on the island of Lanka, after Ravana, the King of the Rakshasas, had abducted her. He hoped to convince her to marry him, but Sita chose to leave his palace and to live in the grove to demonstrate her faithfulness to her husband Rama. Rama is the eighth incarnation (Avatar) of Vishnu durig this world circle. The Ashoka Vatika, also mentioned in the Vishnu Purana, is the setting of many famous Ramayana episodes, particularly of the fifth book called Sundarakhanda. It is in the Ashoka Vatika where Hanuman finally found Sita and prooved to be her husband’s messenger. Sita refused to be rescued by Hanuman, saying, only her husband may free her and carry her away from this island. The pediment at the northern door of the eastern annex, which is larger than the western one, shows Sita’s fire ordeal carved on three registers. At the very centre is Sita with joined hands on a throne carried by Devatas over the flames of the pyre. Above this scene is Rama flanked by Lakshmana on the right and Hanuman on the left. Presumably it depicts the moment when Sita emerges triumphant from the trial. Sita underwent the famous Agni Pariksha ordeal to prove her chastity during her captivity in Ravana’s palace. From the flames arose fire god Agni, who was invoked by Sita, as witness of her fidelity. He left her unharmed and presented her to Rama, who explained the test was necessary to prove her purity and innocence to everybody else, he himself never doubted Sita's faithfulness. 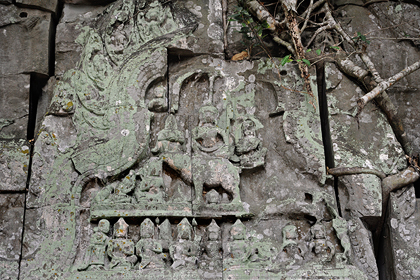 The lintel below has a small deity squatting over the head of a standing lion. A typical scene of the Vishnu mythology can be seen at the western annex. The central door of the southern wall has a small “Churning of the see of Milk”. 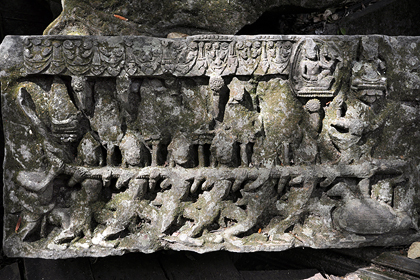 A fragment of a larger lintel carving depicting the same subject can be seen on the ground in the first enclosure. Originally it belonged to the north-eastern library in this innermost enclosure. The Sanskrit name of this theme is Samudra manthan or Sagara manthan. The well-known episode is described in the most famous Vishuite Purana called Bhagavatam as well as in the Visnhu Purana and already in the Mahabharata, too. Vishnu’s second Avatar is Kurma. Gods and demons used the snake Vashuki as a rope to churn the milk ocean and Mount Mandara as the whisk, but once the mountain was placed on the ocean, it began to sink. Vishnu transformed into a turtle Kurma coming to supported the mountain on his back. A not specifically Vishnuite deity is Yama. He can be seen at the eastern annex. The pediment to the south has him on his mount, which seems to be a rhinoceros, though Yama’s mount is Hindu iconography is usually the buffalo. Besides the “Churning of the Milk Ocean”, the “Judgement of Yama” is the most significant mythological subject of the famous bas reliefs in the galleries of Angkor Wat. Like Indra, Yama belongs to the earliest stratum of Hindu mythology, which is laid down in the Vedic scriptures. Three hymns (10, 14, and 35) in the 10th book of the Rig Veda are addressed to him. They report, Yama was the first mortal who died. By virtue of precedence, he became the god of the underworld, the Lord of the judgement of the Departed. In later Hindu iconography, Yama is one of the eight Lokapalas ("World Guardian") of eight directions, protecting the south. Yama is subordinate to Vishnu and Shiva, because he has to judge the deceaced according to the laws of Dharma, and the highest gods in the Purana are in control of Dharma. Also Brahma is subordinate to Vishnu or Shiva, though being the world creator, but only on behalf of the highest god, and despite the fact that he is the personification of the world essence Brahman and is part of the Trimurti, together with Vishnu and Shiva. According to the Brahma Puraņa, he is the father of Manu, from whom all human beings descended. Satues of Brahma depicted him with four heads to the four directions. Brahma originally had a fifth head on top of them, but this was decapitated when he enraged Shiva. In reliefs Brahma is usually shown with only three heads, one to the front and two the sides, wheres the fourth to the back remains unshown. Brahma sits on a lotus bud. Beng Mealea is about 40 km east of Angkor Wat (as the crow flies) and 6.5km southeast of Phnom Kulen. By road it is about 60 km from Siem Reap, the second half of the road is in a poor condition, so it is a 1.5 hour trip by car or 2 hours by Tuktuk. The normal route is via the small town Dam Dek, which is located at National Highway 6 towards Phnom Penh. Turn left immediately after the market and pass through the village of Tuk Lich. Alternatively, there is an abbriaviation not crossing Dam Dek. The car park and ticket counter to the temple are close to a left-hand turn to Koh Ker. The tour is more difficult in the rainy season. A second, longer route, leading to Banteay Srei, too, requires a detour to the north, surrounding the Kulen mountain is not possible. Angkor entrance tickets do not include access to Beng Mealea. The separate ticket for Beng Mealea is available at a ticket counter at the car park. Entering from the south, visitors can use a wooden walkway which leads to many parts of the temple, to its centre in particular. But in order to see the north-eastern library, which is completely covered by roots of a strangler fig, or the south-western annex edifice, which is covered with elaborate carvings, you have to climb a little bit across heaps of stones. Food and drinks are available in front of the temple moat. It is best to undertake a long day trip combining Beng Mealea with either Koh Ker, or Prasat Bakan (Preah Khan Kampong Svay), or Phnom Kulen, or Banteay Srei and Kbal Spean, or Roluos, or Chau Srei Vibol and Banteay Samré, or stilt village Kampong Khleang. With a little luck a trip to Beng Mealea can even be combined with wildlife observation, the region is rich in game and wild animals, also large ones such as elephants. But tigers and panthers are most probably extinct now. Herds of oxen and wild buffalo inhabit the forest as far as Preah Khan of Kompong Svay in the east.